The state’s education budget committees have signed off on moving Alabama’s back-to-school sales tax holiday from the first full weekend of August to the third weekend of July. Wednesday, Feb. 15, the House Ways and Means Education Committee approved HB132 by Rep. Lynn Greer, R-Rogersville; and the Senate Finance and Taxation Education Committee approved SB136 by Sen. Tim Melson, R-Florence. Both bills now move to their respective chambers for consideration. The date change will ensure the tax holiday occurs before the start of the school year throughout the state. Several years in its 11-year history, the August sales tax holiday occurred after school had started in many areas of the state, making it impossible for parents to take advantage of the tax savings. 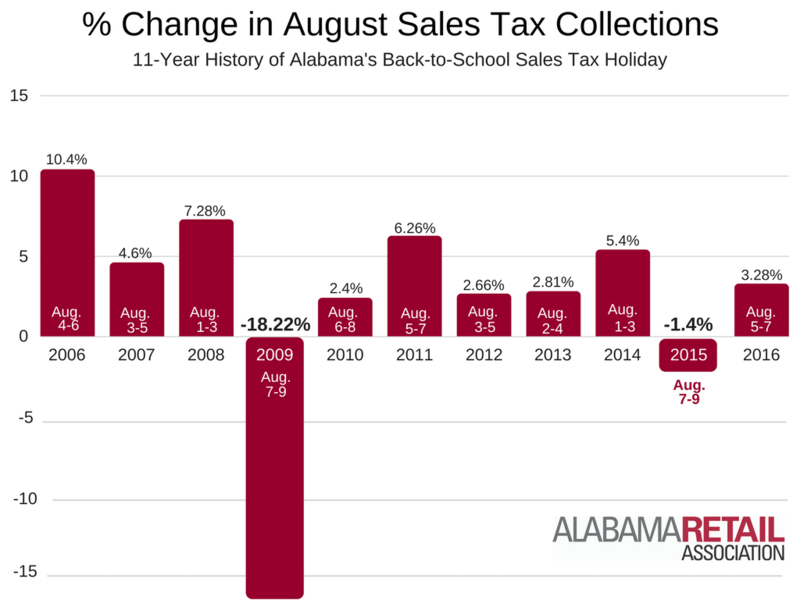 Twice in that history, sales tax collections experienced a decline in the month of August (See graphic below). Both years, the tax holiday occurred at the absolute latest possible time it could, Aug. 7-9, well after most schools had started classes. Alabama Retail championed this tax holiday and made its passage our top legislative priority in 2006, the year the holiday began. Your association supports having the tax holiday start on the third Friday of July each year. If enacted, the timing change would begin with the 2017 tax holiday, moving it to July 21 to 23. This article was first published on the Alabama Retail Association website.